Hepatic metastatic disease from colorectal cancer (CRC) is a significant clinical problem. The liver is the dominant metastatic site for patients with CRC, and although two-thirds of affected patients have extrahepatic spread, some have disease that is isolated to the liver. For patients with isolated liver metastases, regional treatment approaches may be considered as an alternative to systemic chemotherapy (1). Metastases from CRC most commonly develop within 2 years of resection of the primary tumor and are usually asymptomatic; rarely, patients may complain of vague upper abdominal pain. Hepatic metastases associated with CRC may occur regardless of the initial stage of the primary tumor although nodepositive primary lesions are more likely to precede hepatic metastasis (2). **Among these treatments, only surgery is associated with a survival plateau. A biopsy may be indicated to confirm the diagnosis, depending upon the clinical picture. However, fine needle aspiration cytology has not been advocated as a screening test, because of its high risk of complications. It has been shown that the incidence of needle tract metastases is 0.4%-5.1% after fine needle aspiration and use of the procedure in abdominal tumors is fatal in 0.006%-0.031% of cases. Most deaths are due to hemorrhage of liver tumors (3). Laparoscopy has not been advocated as a screening test for colorectal liver metastases due to its invasiveness. Imaging modalities, such as contrast enhanced computed tomography (CT), magnetic resonance imaging (MRI) and positron emission tomography CT (PET-CT), may establish the diagnosis of liver metastasis of colorectal cancer. However, it is more difficult to make the clinical diagnosis of early liver metastases of colorectal cancer due to the absence of typical symptoms or signs. Serological examination including tumor and biochemical markers for liver function evaluation is routinely performed, though its accuracy is not high. In that aspect, carcinoembryonic antigen (CEA) levels is elevated in 63% of patients, while the activity of alanine aminotransferase (ALT) and aspartate aminotransferase (AST) is increased in about 30% of patients with liver metastases of colorectal cancer. Resection offers the greatest likelihood of cure for patients with liver-isolated CRC. In surgical case series, five-year survival rates after resection range from 24 to 58 percent, averaging 40 percent and surgical mortality rates are generally <5 percent (1). It’s worth noted that subgroups with advanced age, comorbid disease, and synchronous hepatic and colon resection may have higher procedure-related mortality and worse long-term outcomes. The five-year survival rate was only 25 percent, Even so, five-year survival rates with the most active systemic chemotherapy regimens are only 10 to 11 percent, only about one-fifth of whom have a sustained disease remission. More so, approximately one-third of five-year survivors suffer a cancer-related death, while those who survive 10 years appear to be cured (4). Because of its clear survival impact, surgical resection is the treatment of choice when feasible. Unfortunately, no more than 20 percent of patients with isolated hepatic metastases are amenable to potentially curative resection. Most are not surgical candidates because of tumor size, location, multifocality, or inadequate hepatic reserve. Patient candidates for resection – The criteria for resectability differ among individual liver surgeons regarding borderline cases, from center to center and from country to country. One consensus statement defined absolute unresectability as nontreatable extrahepatic disease, unfitness for surgery, or involvement of more than 70 percent of the liver or six segments (1,2). Patients are evaluaed using preoperative liver MRI and intraoperative ultrasound which offer the optimal assessment of the number, size, and proximity of tumors to key vascular and biliary structures. Some of these exclusion criteria have been challenged. Better and safer surgical techniques are now more suitable for patients with multiple, even bilobar tumors. Achieving wide margins doesn’t increase the 5-year survival. **** Only patients with a positive margin had worse survival and a higher intrahepatic recurrence rate. Presence of portal lymph node metastases – still been challenged and results are controversy. A major problem is the prediction of metastatic lymph nodes in the hepatic pedicle in patients with CRC liver metastases. The presence of portal node metastases is not inevitably associated with distant metastases. Outcome was more favorable if nodal involvement was limited to the porta as compared to along the common hepatic artery. The presence of other sites of limited extrahepatic metastases (particularly lung) should not be considered a contraindication to resection as long as the disease is amenable to complete extirpation. However, outcomes in this group are not as favorable, particularly when there are >6 liver metastases. In modern treatment paradigms, laparoscopy is infrequently performed, particularly since many patients have undergone surgical exploration of the peritoneum at the time of resection of a synchronous primary tumor. Laparoscopy is usually reserved for those thought to be at the highest risk for occult metastatic disease. A growing number of authors report that staging laparoscopy (including laparoscopic US) performed under general anesthesia just prior to planned resection will identify 16 to 64 percent of patients with unresectable disease. This approach is particularly useful in identifying small peritoneal metastases, additional hepatic metastases, and unsuspected cirrhosis. Laparoscopy in this setting is less likely to identify lymph node metastases, vascular compromise, and extensive biliary involvement that might render a patient unresectable (2,6). The availability of increasingly effective systemic chemotherapy has prompted interest in preoperative or neoadjuvant systemic chemotherapy prior to liver resection. It may be considered as a means of “downsizing” liver metastases prior to resection to lessen the complexity of hepatic metastasectomy or for initially unresectable metastatic disease (1). Chemotherapy, has many side effects including liver toxicity such as: steatosis (chemotherapy-associated steatohepatitis, CASH), vascular injury, and nodular regenerative hyperplasia in the livers. For low-risk (medically fit, four or fewer lesions), potentially resectable patients, initial surgery rather than neoadjuvant chemotherapy should be chosen, followed by postoperative chemotherapy. For patients who have higher risk, borderline resectable or unresectable disease, neoadjuvant chemotherapy is the preferred approach. Bevacizumab – Its addition to traditional chemotherapy results in a modestly higher frequency of tumor regression compared to regimens that do not include bevacizumab. However, these benefits have come at the cost of significant treatment-related toxicity. Such as: such as stroke and arterial thromboembolic events, bowel perforation and bleeding. Data regarding the need and timing of use of bevacizumab is somewhat conflicting. Cetuximab (if K-ras wild type) and panitumumab (if K-ras wild type) are also suggested as part of the chemotherapy regimen in certain clinics are regional dependent. Intraarterial (HIA) chemotherapy – The administration of chemotherapy into the hepatic artery. The benefit of this approach is remains unclear. A combined approach of HIA floxuridine plus systemic chemotherapy (oxaliplatin plus irinotecan) was explored in a single institution study of 49 patients with initially unresectable CRC liver metastases. Overall, 92 percent had either a complete or partial response rate to chemotherapy, and 23 (43 percent) were able to undergo a later resection, 19 with negative margins. The median overall survival from pump placement for the entire cohort was 40 months (1, 7). Another approach is HIA oxaliplatin combined with systemic 5-FU and leucovorin for patients with initially unresectable but isolated hepatic CRC metastasis. It should be noted that this approach is not used by many clinicians outside of New York City. The only way to assess the contribution of HIA chemotherapy to neoadjuvant systemic chemotherapy is with a randomized controlled trial. Portal vein infusion — Because HIA FUDR carries a risk for biliary sclerosis, administration into the portal vein has been explored as an alternative. hepatic micrometastases (as well as the biliary tree) are primarily dependent on the portal vein for their blood supply. Like HIA infusion, portal vein infusion (PVI) carries with it a significant regional exposure advantage. The potential benefit of adjuvant PVI with FUDR after resection or ablation of isolated hepatic metastases was evaluated in two trials conducted at the City of Hope Medical Center (1, 8). The benefit of this approach was somewhat lower than has been reported with HIA FUDR and systemic 5-FU. Therefore, the use of this approach is limited. Hepatic radiotherapy — The use of external beam radiotherapy and internal application of radiation therapy through the use of yttrium-labeled microspheres. Radiation therapy (RT) has traditionally had a limited role in the treatment of liver tumors, primarily because of the low whole-organ tolerance of the liver to radiation (9). When radiation is applied to the entire liver, RT doses of 30 to 33 Gy carry about a 5% risk of radiation-induced liver disease (RILD). The risk rises rapidly, such that by 40 Gy, the risk is approximately 50%. Considering that most solid tumors require RT doses higher than 60 Gy to provide a reasonable chance for local control, it is not surprising that wholeorgan liver RT provides only a modest palliative benefit rather than durable tumor control. Hepatic dysfunction after RT is a very frequent event. Liver metastasis are a very tough disease to battle and the outcome is not encouraging. Currently, surgical resection is the only potentially curative option for patients with liver-isolated metastatic colorectal cancer. For appropriately selected patients with four or fewer metastases, five-year relapse-free survival rates average 30 percent. Diagnostic laparoscopy is suggested only in patients with a suspicion of low-volume carcinomatosis based on preoperative radiographic imaging and for selected other cases at high risk for intraperitoneal metastatic disease. The optimal chemotherapy regimen is still not fully established but some suggestions have been made and the benefits of using HIA is still not clear. Standardization of scoring, timing, surgical techniques , results from clinical trials and advanced research will offer better hope for these patients, who now, have a very bad prognosis and survival rates. According to Dr. Neil Risch a leading expert in statistical genetics and the director of the UCSF Institute for Human Genetics, “Personalized medicine, in which a suite of molecules measured in a patient’s lab tests can inform decisions about preventing or treating diseases, is becoming a reality” (7). Colorectal cancer (CRC) is the third most common cancer and the fourth-leading cause of cancer death worldwide despite advances in screening, diagnosis, and treatment. Staging is the only prognostic classification used in clinical practice to select patients for adjuvant chemotherapy. However, pathological staging fails to predict recurrence accurately in many patients undergoing curative surgery for localized CRC (1,2). Most of the patients who are not eligible for surgery need adjuvant chemotherapy in order to avoid relapse or to increase survival. Unfortunately, only a small portion of them shows an objective response to chemotherapy, becoming problematic to correctly predict patients’ clinical outcome (3). In the past few years many studies have exploited microarray technology to investigate gene expression profiles (GEPs) in CRC, but no established signature has been found that is useful for clinical practice, especially for predicting prognosis. Only a subset of CRC patients with MSI tumors have been shown to have better prognosis and probably respond differently to adjuvant chemotherapy compared to microsatellite stable (MSS) cancer patients (6). Pritchard & Grady have summarized the selected biomarkers that have been evaluated in colon cancer patients (10). Examples for the great need of personalized medicine tailored according to the patients’ genetics is clearly seen with two specific drugs for CRC: Cetuximab and panitumumab are two antibodies that were developed to treat colon cancer. However, at first it seemed as if they were a failure because they did not work in many patients. Then, it was discovered that if a cancer cell has a specific genetic mutation, known as K-ras, these drugs do not work. This is an excellent example of using individual tumor genetics to predict whether or not treatment will work (8). According to Marisa L et al, however, the molecular classification of CC currently used, which is based on a few common DNA markers as mentioned above (MSI, CpG island methylator phenotype [CIMP], chromosomal instability [CIN], and BRAF and KRAS mutations), needs to be refined. CRC is composed of distinct molecular entities that may develop through multiple pathways on the basis of different molecular features, as a consequence, there may be several prognostic signatures for CRC, each corresponding to a different entity. GEP studies have recently identified at least three distinct molecular subtypes of CC (4). Dr. Marisa Laetitia and her colleagues from the Boige’s lab however, have conducted a very thorough study and identifies 6 distinct clusters for CC patients. Herein, we’ll describe the majority of this study and their results. Marisa L et al (1) performed a consensus unsupervised analysis (using an Affymertix chip) of the GEP on tumor tissue sample from 750 patients with stage I to IV CC. Patients were staged according to the American Joint Committee on Cancer tumor node metastasis (TNM) staging system. Of the 750 tumor samples of the CIT cohort, 566 fulfilled RNA quality requirements for GEP analysis. The 566 samples were split into a discovery set (n = 443) and a validation set (n = 123). The seven most frequent mutations in codons 12 and 13 of KRAS . Tumors classified as C1, C5, and C6 were more frequently CIN+, CIMP−, TP53– mutant, and distal (p<0.001), without any other molecular or clinicopathological features able to discriminate these three clusters clearly. Tumors classified as C2, C4, and C3 were more frequently CIMP+ (59%, 34%, and 18%, respectively, versus <5% in other clusters) and proximal. C2 was enriched for dMMR (68%) and BRAF- mutant tumors (40%). C3 was enriched for KRAS- mutant tumors (87%). Note: No association between clusters and TNM stage (histopathology) was found, except enrichment for metastatic (31%) tumors in C4. Most signaling pathways were down-regulated in C1 and C3. In C1, cell communication and immune pathways were down-regulated. In C5, cell communication, Wnt, and metabolism pathways were up-regulated. The authors have identified six robust molecular subtypes of CC individualized by distinct clinicobiological characteristics (as summarized in table 2). This classification successfully identified the dMMR tumor subtype, and also individualized five other distinct subtypes among pMMR tumors, including three CIN+ CIMP− subtypes representing slightly more than half of the tumors. As expected, mutation of BRAF was associated with the dMMR subtype, but was also frequent in the C4 CIMP+ poor prognosis subtype. TP53– andKRAS-mutant tumors were found in all the subtypes; nevertheless, the C3 subtype, highly enriched in KRAS-mutant CC, was individualized and validated, suggesting a specific role of this mutation in this particular subgroup of CC. 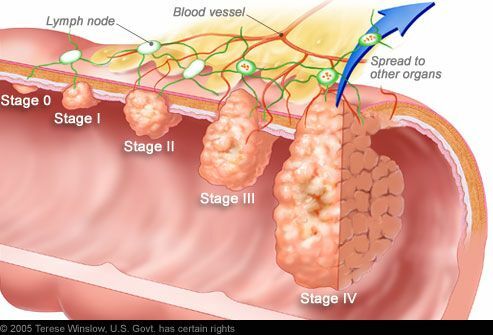 Current Treatments for colon cancer- Table 3 (11) . Exploratory analysis of each subtype GEP with previously published supervised signatures and relevant deregulated signaling pathways improved the biological relevance of the classification. The biological relevance of our subtypes was highlighted by significant differences in prognosis. In our unsupervised hierarchical clustering, patients whose tumors were classified as C4 or C6 had poorer RFS than the other patients. Prognostic analyses based solely on common DNA alterations can distinguish between risk groups, but are still inadequate, as most CCs are pMMR CIMP− BRAFwt. The markers BRAF-mutant, CIMP+, and dMMR may be useful for classifying a small proportion of cases, but are uninformative for a large number of patients. Unfortunately, 5 of the 9 anti-CRC drugs approved by the FDA today are basic cytotoxic chemotherapeutics that attack cancer cells at a very fundamental level (i.e. the cell division machinery) without specific targets, resulting in poor effectiveness and strong side-effects (Table 3) (11). An example for side effects induction mechanisms have also been reported in CRC for the BRAF(V600E) inhibitor Vemurafenib that triggers paradoxical EGFR activation (12). The authors of this study “report a new classification of CC into six robust molecular subtypes that arise through distinct biological pathways and represent novel prognostic subgroups. Our study clearly demonstrates that these gene signatures reflect the molecular heterogeneity of CC. This classification therefore provides a basis for the rational design of robust prognostic signatures for stage II–III CC and for identifying specific, potentially targetable markers for the different subtypes”. These results further underline the urgent need to expand the standard therapy options by turning to more focused therapeutic strategies: a targeted therapy-for specific subtype profile.. Accordingly, the expansion and the development of new path of therapy, like drugs specifically targeting the self-renewal of intestinal cancer stem cells – a tumor cell population from which CRC is supposed to relapse, remains relevant. Therefore, the complexity of these results supports the arrival of a personalized medicine, where a careful profiling of tumors will be useful to stratify patient population in order to test drugs sensitivity and combination with the ultimate goal to make treatments safer and more effective. Colorectal cancer is the third most common type of cancer diagnosed in the United States and is the third most common cause of cancer-related death. The majority of cases are sporadic, with hereditary colon cancer contributing up to 15% of all colon cancer diagnoses. Treatment consists of surgery for early-stage disease and the combination of surgery and adjuvant chemotherapy for advanced-stage disease. Management of metastatic disease has evolved from primary chemotherapeutic treatment to include resection of single liver and lung metastases in addition to resection of the primary disease and chemotherapy (1-4). In the United States, colorectal cancer (CRC) is the third most common type of cancer diagnosed and the third most common cause of cancer-related death in men and women. In 2010, an estimated 102,900 new cases of colon cancer were diagnosed (49,470 male, 53,430 female) and 51,370 patients (26,580 male, 24,790 female) died from CRC. The death rate from colon cancer decreased over the preceding decade, from 30.77 per 100,000 people to 20.5 per 100,000 people. The lifetime risk of developing colon cancer in industrialized nations is 5% and is stable or decreasing. In contrast, the incidence in developing countries continues to rise, hypothesized to be due to increased exposure to risk factors. It has been estimated that 1.5 million people in the United States will be living with CRC by 2020.The financial burden of caring for this population is significant: $4.5 to $9.6 billion per year. aAbbreviations: FAP, familial adenomatous polyposis; GI, gastrointestinal. Essentially all of the genes discussed above are conclusively implicated in subsets of CRC due to speciﬁc somatic defects that either activate or inactivate gene and protein function. It is hypothesized that essentially any gene with dysregulated expression in CRC—either increased or decreased expression—may have a functionally signiﬁcant role as an oncogene or a TSG, respectively. The aggregate data on the mutations and function of any given gene must be carefully evaluated to establish whether the gene truly contributes to CRC pathogenesis and whether it should be designated as an oncogene or a TSG (5,6). The first proposed genetic model of CRC assumed that most CRCs arise from preexisting adenomatous lesions and that the accumulation of multiple gene defects is required for CRCs. Benign GI tumors are a varied group, but localized lesions that project above the surrounding mucosa are commonly termed polyps. In humans, most colorectal polyps, particularly small polyps less than 5 mm in size, are hyperplastic (6). Most data indicate that hyperplastic polyps are not a major precursor to CRC; rather, the adenomatous polyp, or adenoma, is probably the important precursor lesion (7). ” Adenomas arise from glandular epithelium and are characterized by dysplastic morphology and altered differentiation of the epithelial cells in the lesion. The prevalence of adenomas in the United States is approximately 25% by age 50 and approximately 50% by age 70 (8)”. Only a fraction of adenomas progress to cancer, and progression probably occurs over years to decades. Individuals affected by syndromes that strongly predispose to adenomas, such as FAP, invariably develop CRCs by the third to ﬁfth decade of life if their colons are not removed”. A more recent and modified version of the genetic model postulate that each gene defect described in the model occurs at high frequency only at particular stages of tumor development. This observation is the basis for assigning a relative order to the defects in a multistep pathway. Mutations in the KRAS proto-oncogene are found in 40-45% of patients with CRC and occur mainly in exon 2 (codon 12 and 13) and to a lesser extent in exon 3 (codon 61) and exon 4 (codon 146). A number of studies have evaluated a potential prognostic role of KRAS in clinical practice for the treatment of colorectal cancer. However, clinical study design, reproducibility, interpretation and reporting of the clinical data remain important challenges. Laurent-Puig’s group was the first to show the negative predictive value of KRAS mutations for response to the EGFR monoclonal antibody (mAb) cetuximab (11, 12, 13). Ever since then, a number of large phase II-III randomized studies have confirmed the negative predictive value of KRAS mutations for response to cetuximab and panitumumab treatment. The role of KRAS mutations in predicting response to other therapies remains unclear. A subset analysis of patients treated in the phase III study of bevacizumab plus IFL (irinotecan, bolus 5-FU, and folinic acid) versus IFL showed that the clinical benefit of bevacizumab is independent of KRAS mutational status (11, 14). “The KRAS biomarker story is unique in several ways. It represents the first biomarker integrated into clinical practice in CRC“. The high prevalence of KRAS mutations in CRC and its strong negative predictive value for EGFR mAb therapies, has led to its rapid acceptance as a valuable biomarker. The EMEA, FDA and ASCO47 now recommend that all patients with metastatic CRC who are candidates for anti-EGFR mAb therapy should be tested for KRAS mutations and, if a KRAS mutation in codon 12 or 13 is detected, then patients should not receive anti-EGFR antibody therapy. More so, Data from the PETACC-3 trial, presented at ASCO 2010, have shown that KRAS and BRAF mutant CRC tumors induce different gene-expression profiles, further reiterating that these tumors have a distinct underlying biology. Despite intensive progress in the field of genomic research, none of these genomic markers are used routinely in clinical trials. Only, nowadays, trials are starting to use specific gene-pathway” target in CRC clinical trials. Early studies are underway to understand the role of DNA methylation, chromatin modiﬁcation, changes in the patterns of mRNA and noncoding RNA expression, and changes in protein expression and posttranslational modiﬁcation. However, we do not yet have an indepth and comprehensive understanding of the pathogenesis of the biologically and clinically distinct subsets of CRC. Careful design of clinical trials end points and validation of the genes as potential prognostic markers will allow a better outcome for these patients.